As prophesied, the Lord Jesus is coming again. First He comes in the sky to remove the Church Age Saints prior to the seven years of horrific Tribulation. Then again seven years later to defeat Satan and rule from Jerusalem as King of the Earth for 1000 years. All of our sins, past, present and future, were nailed to the Cross some 2000 years ago. Whatever you did wrong yesterday, whatever you do wrong today and whatever you do wrong in the future was all covered by Jesus blood atonement. So there is nothing left for you to do, or not do, in this life. You are as cleansed as you’ll ever be and ready to meet the Lord in the air just as you are. You won’t have to endure a future tribulation as there is nothing that has not already been paid for on the Cross. More than anything, we’re not instructed to look down, at the earth, for the Antichrist, but rather to look up, to heaven, for Jesus Christ! This means we’re looking for the true white horse of Revelation 19:11, not the false white horse of Revelation 6:2. But the two arrivals can still be confusing. Sometimes it’s hard to know which verse refers to the Rapture and which verses refer to the Return. So the following will help clear the fog. 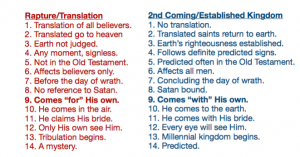 The clearest way to distinguish between the two is to determine if the verse in question is referring to the Lord coming “for” His saints, or “with” His saints. These two list comparisons show in no uncertain terms that there are definitely two distinct comings, coming for His Church and coming with His Church. Nothing could be plainer in Scripture!